Brown signed a reserve/future contract with the Colts on Sunday. 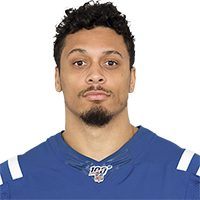 Analysis: Brown finished the 2018 season on the Colts' practice squad after spending time with Philadelphia earlier in the season. He'll now stick around in Indianapolis for the offseason with hopes of earning a potential No. 4 job at tight end behind Jack Doyle (torso), Eric Ebron and Mo Alie-Cox. Brown signed to the Colts' practice squad Thursday. Analysis: Brown previously spent time with Philadelphia's practice squad this season. With Jack Doyle (torso) on injured reserve, and Eric Ebron (illness), Erik Swoope (knee), and Mo Alie-Cox (calf) all nursing injuries, Brown could conceivably earn a depth role on the 53-man roster. The Eagles released Brown for their practice squad Tuesday. Analysis: Brown signed with Philadelphia's practice squad in September, but with tight end's Zach Ertz and rookie Dallas Goedert firmly entrenched in the position, Brown's shot of making the active roster was minuscule. Brown signed to the Eagles' practice squad Thursday, Graham Foley of the Eagles' official site reports. Analysis: Brown spent the 2017 season on the Eagles' practice squad and signed a reserve/future contract with the team in February, but he was unable to earn a spot on the 53-man roster. The 26-year-old has no clear path to Philadelphia's roster with the team's tight-end group of Zach Ertz, Dallas Goedert and Joshua Perkins all currently healthy. There are no videos available for Billy Brown. Click here to view all videos.